I was determined not to—once was enough—and then I was walking past the IFC Film Center this afternoon and . . .
Impulse-bought a ticket to see “Rebirth.” What did it was probably my oblique personal connection to the late FDNY Capt. Terry Hatton, whose friend is one of those interviewed. His wife was Mayor Giuliani’s personal assistant Beth Petrone; her brother was the publicist we’d hired because I had an article about J’s slow recovery from trauma coming out in Oprah’s magazine. Curiously, it was called “Journey to Healing,” and it appeared 9/10/2001. Small, silver lining: Hatton and Petrone had been trying to conceive; afterwards, she discovered she had, and daughter Terri was born the following year. The movie is very, very good and very moving in the parallels it finds between the rebuilding of bodies, lives, and buildings — in all cases a halting, back-and-forth process, more complex than you might expect. The people whose lives were followed through the years from 2001 to 2009 were amazingly brave about revealing their emotions. This was sort of the premiere and the filmmakers were there to answer questions, as well as two of the principals. After the film I felt absolutely compelled to stay and talk to Terry Hatton’s friend, Tim Brown, which was absurd because my connection to the family was so tenuous, but they were “my” 9/11 family nonetheless. Terri Hatton is “doing great” and still has on her wall cut-out heads of Miley Cyrus, Justin Timberlake — and Tim Brown! The film will be at IFC film center down the block from me for some weeks, and in other theaters around the country, and will air on Showtime on 9/11. Try to see it on the big screen, because the panoramic time-lapse photography of the site is breathtaking, and the intimacy of the close-ups is enlarged. There’s also a marvelous middle-aged Chinese-American woman in the film, Ling, who was very badly burned and went through 40 surgeries trying to regain freedom of movement constricted by terrible keloid scarring. In spite of everything, she is FUNNY. She was there and I got to tell her she was my hero because she was funny. And I got to point out to her that when she got up her “reserved” sign was stuck to the seat of her pants, which was very much in her spirit. This is the way to remember 9/11 — not static but dynamic. UPDATE: The most spiritual person in this movie is a construction supervisor. He does not utter a Christian piety, nor is there even a hint of new-age Candide, “all’s for the best in this best of all possible universes.” Rather, expressed in completely new words which he gropes for and finds onscreen, it’s his direct response to the site, which he instinctively senses is sacred, and from the moment his firefighter brother dies there, Brian is possessed and driven by the imperative to rebuild it, right through and out the other side of the PTSD that blindsides him a couple of years after the event. It’s the first time you’ll ever think of a construction worker as an agent of resurrection. This struck me because it matched up with my experience in very different Greenwich Village. I’d had a fantasy that the hurricane would bring the people in my little building together. The scattering of old-timers who’d welcomed me back so warmly and the more transient young people who exchange friendly “Hi!”s at the mailbox would check up on each other, make sure we all had what we needed, make a plan to join forces and even party if the power went out. By contrast, enormous caring and concern was expressed by my (and no doubt by everyone’s) social “cloud,” via Facebook, e-mail, and phone. So here we sit, in adjacent cubicles, wired in to our far-flung, nebulous networks, with physical presence and proximity meaning next to nothing. Only if the power had actually gone out would we have been forced into each other’s company. What’s this all about?? I find it creepy. The retired Bridgeport carpenter woke up in his Isinglass Road home to a power outage that included his phone, so he tried a different way of calling for help. Meanwhile, I am very concerned to hear from Karen, since Vermont reportedly was hard hit by wind. Karen, I’m sure you have a lot on your hands, and possibly no power, but give us a report when you can. Did all the cows, calves, and horses weather the storm? Did your neighbors look out for each other?
. . . is a strange experience. Television, annoying a companion as it is, is what mediates collective experience to us, especially in crises, keeps us “in the know” (or provides a comforting, deceptive illusion thereof), and makes us feel a part of something larger—a community and an event. For us who live alone, for all its drawbacks it is perhaps particularly important—a voice in the house—as a divorced friend has been exhorting me in vain. The computer, normally welcome because it doesn’t harangue you with overhyped drama, incessant repetition, and noisy sales pitches, is eerily silent now. I usually prefer to get my information by reading—certainly not by watching video snippets, which you have to activate voluntarily and which are the worst of television, rendered-down, semiliterate, breathless, frustrating in what they fail to tell you. But reading is a cold experience when you are facing a mass-scale event paradoxically alone. I’ll turn on live streaming AM news radio and will no doubt quickly get annoyed by the repetition, the trivia, the jocular commercials (there it goes: “You may be a candidate for dental implants!”), the attempt to drum up drama where as yet there is none (“What’s it like where you are?” “Rain is still pouring down . . .”). The winds are supposed to intensify overnight and the worst to come between 5 A.M. and 5 P.M. tomorrow. Irene is a slow-moving beast. Of course, if and when there is the nearly inevitable power outage, TV and the Internet will both be gone and only a battery-operated radio (which I failed to buy in time, but which some neighbor probably has) will provide vital information. The result will probably be renewed bonding with neighbors, a taste of the unwired world we would revert to if there were a massive grid crash or sabotage. It will be a novel experience for the young, who will keep reflexively checking their blank iPhones, and a nostalgic one for older generations. As New York prepares for the biggest amount of blow since Studio 54, here’s hoping our blogmistress finds some isle of security from Hurricane Irene, complete with cats in tow! Fingers — and eyes! — crossed! This strikes me as the most important thing I’ve read in a while. It is along the same lines as this but goes farther and is more forthright, less academically circumlocutory. And it’s completely in sync with the Feldenkrais Method training I’ve started, the only thing I’ve ever done that is intellectually exciting in an embodied, experiential way. Inscribed on a Sumerian clay tablet, circa 2500 BC. Is the Stock Market Evil? Idle thought: I’m just wondering whether the wealth-creation twist that the stock market adds to the straightforward transactions of the economy—folding a froth of gambling fever into solid value, like beaten egg whites into a soufflé—might not actually be the devil’s work. Whether someone writing a bible today might not ban it the way the original banned usury. Join the “End of Work” Think Tank. Ron Fisher’s new blog, on a topic he’s been thinking about a lot lately. The “job” model of human purpose and sustenance is dying a painful death—corporations now raise their profits and productivity by getting rid of people—but what will replace it?? There clearly won’t be anywhere near enough “jobs” for the world’s growing population, and Ron suspects we’re in a third great transition, following those from hunting-gathering to agriculture and from agriculture to industry. But . . . to what? We’re all thinking about it, we need a place to talk about it. Go on over and weigh in; throw some thoughts and links on the fire. 2. A cashier at Wal*Mart. That oughtta get you started. 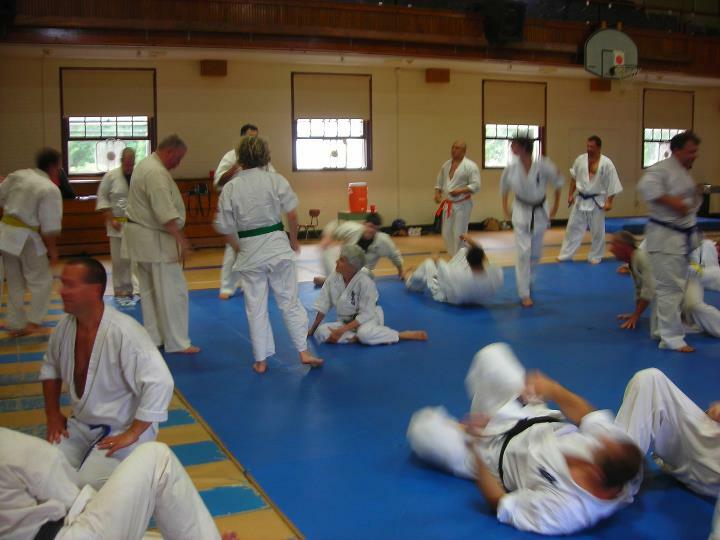 See if you can find me in this “entr’action” photo (by Caroline Tuchscherer from Montréal) from the weekend karate training camp (gasshuku) at Green Mountain Dojo in Stowe, Vermont, run by longtime friends of my heart and J’s, Tom and Toni Flynn. After the training, Monday morning I was entrusted with the keys to the official Green Mountain vehicle, drove one hour north to the Northeast Kingdom, and finally met our Karen, her splendid husband Allan, and their 47 milk cows! (Plus two dogs, two neighbors, and more than a dozen chickens.) A cow licked my hand, I held warm newly-laid eggs in said hand, and most of all I got to lay eyes on (and arms around) one of my best blogfriends and her good man. New friends of my lonely heart. The most striking thing about Vermont per se is its luminous sky. It’s almost always full of dramatic, puffy white clouds, and the day seems lit not by the sun but by the silvery, icy light of these clouds, which makes the green land and blue sky look hyperreal. I’ll post more pix as they come to light.